Anyone whose been to the British Wildlife Center knows how damn hard it is to photograph this lil' guy. Ah! the mighty weasel surveys his Empire. These guys are so dainty and pretty! True that I think it took me 3 seperate visits to even catch a glimpse of him. I hope you're not angry with this. Awh, thankyou! I like it! this is so sweet! may i use it in my roleplaying blog? you'll get the link if you like and i will reference back to here! Can I use this for my icon? Ike! That's so cute! Awesome shot! I havn't been able to top it! Wow, very adorable! I love it! this picture is so beautiful! Ohh, he's absolutely precious. <3 What a gorgeous pose to capture. Cool. In thumb it looks like a little lawn decoration. Keeps itself rather clean. Great shot. I'm going to have to get myself down there real soon. Exquisite capture, and ace pose! I'm sure you could sit for hours and not get another shot as good!! 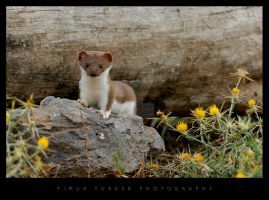 Love it!I used to see stoats when I worked at a ski centre in Scotland, and more recently in a gas refinery in Peterhead - lots of rabbits there!! Lunch!! They were NEVER still - always on the go and bold as brass!! Great entertainment value!